In February 2016, the Canadian Senate asked that the Standing Senate Committee on Social Affairs, Science and Technology study the issue of dementia in our society and to provide a final report in January 2017. 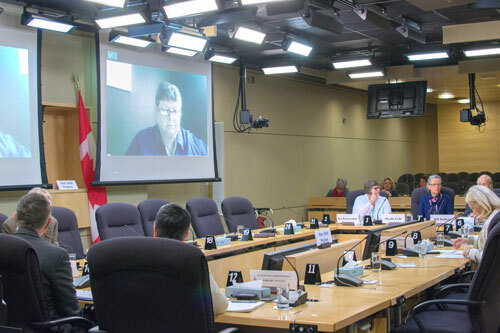 On May 18, Mary Beth Wighton and the other members of the Ontario Dementia Advisory Group (ODAG) presented to the committee. Thank you for inviting us to appear before you this afternoon. It’s an honour to represent the 747,000 Canadians living with dementia. It is important that people with dementia are able to participate as equals in all dialogue about us. According to the UN Convention on the Rights of Persons with Disabilities (CRPD) this is our human right. The Ontario Dementia Advisory Group (ODAG) is a group of people with dementia living in Ontario. We are involved in policy-making strategies, research projects and education initiatives at the local, provincial and national level. We have close ties to Dementia Alliance International, the international self-advocacy group of people with dementia. We are here today as a united voice of four people. When one falters, the others will step in. This is what makes us strong. We are parents, grand-parents, spouses, and friends. We have all had long and successful careers. When we were diagnosed with dementia, these experiences did not disappear; they are and will always be a part of us. We rely on these roles and experiences to help us with our advocacy work. The need for more research emphasis on a social rather than a medical model. Research does not only focus on a cure. It is important to take a more holistic approach to well-being. Lack of involvement of people with lived experience, stigma and insufficient education regarding dementia is deep rooted in Canadian society. This impacts us greatly. When I was diagnosed with probable frontotemporal dementia at the age of 45, I was told to get my affairs in order, that I had about 5 to 8 years to live and would eventually live in long-term care. My partner was told she would be responsible for my welfare and that it would eventually become totally time-consuming. The doctor then revoked my license on the spot. She told me I did not have the capacity to drive any longer. Interesting, as I drove to the hospital without any issues. My loss of license was done without any kind of due process. My story is like most other people living with dementia. It is our desire to live life fully and utilize our remaining skills that help us remain strong. We reject the notion of going home to die. The time between diagnosis and end-stage dementia can be many years. In the meantime, we have the ability to live life well. If I had been diagnosed with a different illness, like a stroke, I would have received an interprofessional team approach to my care. However, dementia is different. There is not a single government body dedicated to dementia. The current health-related silos don’t work well either. This results in difficulties in achieving our optimal physical, cognitive, emotional, communicative, and social well-being. If I had been diagnosed with a different illness, like cancer, the oncologist would spend time with me, educating me about this disease and options I have available. However, dementia is different. I received a pamphlet from the doctor; she said she would notify my local Alzheimer Society as they are the experts in dementia. Beyond that, she did not offer any hope, services or suggestions to live life well with dementia, or to fully participate in society. Finding a cure for dementia is extremely important, but our lived experience is as important as finding a cure. We hope there is a more balanced focus in research – not only about a cure but better services, treatment and care. In August 2016, Canada will be the first country to report on its progress in supporting people with disabilities to the CRPD. It has agreed to be a pilot for others to learn from. We believe this can be used to advocate for improvements in dementia care and services. Equality and non-discrimination, including the provision of ‘Reasonable accommodation” and accessibility: This may include unlawful discrimination by health care, driving license authorities, insurance companies and employers. In a nut-shell, this means to make changes so we can continue to participate and have access to anything and anywhere – the same as anyone else. Introduction of the Dementia Friendly Communities (DFC) model. It has goals of reducing stigma; ensuring an early diagnosis; having consistent and reliable travel options; practical support; community based solutions, including helping us to live independently and safely in our own homes. There are many benefits of this model, including empowerment for people with dementia and the financial benefit to less time needed in costly residential or hospital care. Reduction of the disproportionate use of antipsychotic drugs, physical restraints and being detained in psychiatric institutions. The time is now to make lasting changes affecting people living with dementia and their carepartners. This must be done with us and not for us. Mary Beth is a retired vice-president and owner of a recruiting firm. She spent 10 years in dot com as a senior business analyst. Mary Beth was diagnosed with probable frontotemporal dementia in 2012 at age 45. She, along with her partner Dawn and daughter Brianna, work to challenge the stigma of dementia. She is an advocate locally, provincially, and internationally, and was named a Champion for Dementia by the Waterloo-Wellington Alzheimer Society. She has had her writings about living with dementia internationally distributed through blogs and websites. She was a keynote speaker at the 2014 A Changing Melody forum, MAREP’s 2013 Alzheimer Awareness event, and was a key figure in MAREP’s 2014 video series “A New Voice: Living Well with Dementia”. She has been a panel member at various events.